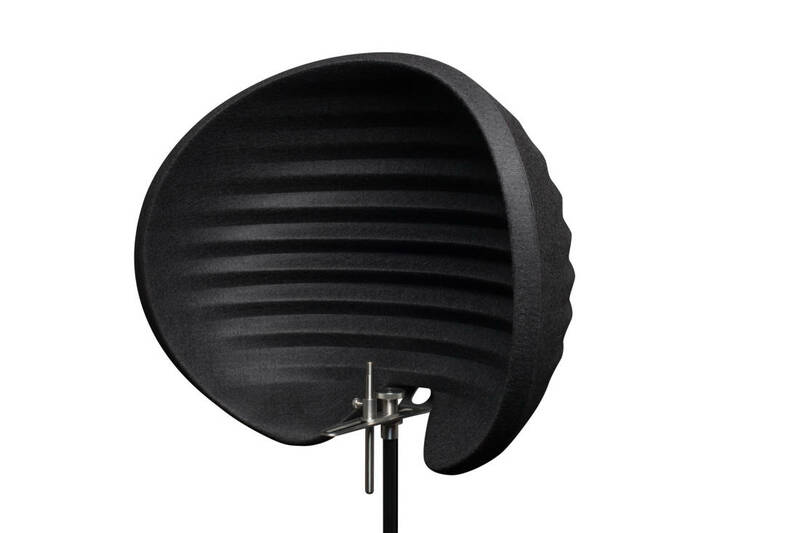 The same superb performance as the Aston Halo reflection filter, with a new look in all black finish for those who want a more 'moody' space to work with. In a market awash with differing versions of an ageing design concept, the Aston HALO is a huge leap forward in reflection filter technology. There are several key areas on which we focused on improving currently available technology, most notably for isolation, absorption, mounting hardware and the general performance as a studio tool for achieving portable room control. HALOs unique design is also patented its much bigger, wraps around top and bottom to a maximum rear depth of almost 100mm to improve room isolation and absorption without dominating the room sound. Its textured and wave-formed surface also helps diffuse direct sound. Market research revealed that many people have a hard time with getting a good performance when using other reflection filters because they are not very creative-friendly environments. The HALOs form and colour scheme is designed to create a more organic-feeling space for the performer to work with. The lightweight material design, coupled with beautifully engineered easy-mount hardware, means the HALO is quick and easy to set up, stable on mic stands, and sounds and looks fantastic.